Are you mourning the loss of your carefully decorated and organised home to toy clutter and grubby little hands? We just may have a solution that gives you the best of both worlds. Australian designers (and husband and wife team) Mint Rhapsody have come up with a simple but innovative idea that ensures your playpen can ‘blend and not offend’ – it is invisible! In the design duo’s own words, “After searching and searching and only finding what resembled a UFC fighting cage or a primary coloured jail, we realised it was time to design our own version”. The unique and simplistic design works to maximise your space and minimise your toy clutter. The Invisible Play Pen is just visible enough to appreciate the brilliance of the concept and ensure you don’t run into it – even the screws on the playpen are transparent. Strong and durable, this stunning playpen allows your child to feel like they are part of the family and see what is going on so they are happier to stay and play in a safe, contained environment. The Invisible Play Pen is hygienic to use, easy to clean and can be dismantled and stored in a flat pack when it’s not in use. My tiny shoebox of a house would revel in this kind of brilliance; sign me up. Check out some of the other cool acrylic products that Mint Rhapsody are producing. There is an awesome Attic House which is an acrylic version of a dollhouse and some amazing shelving options. 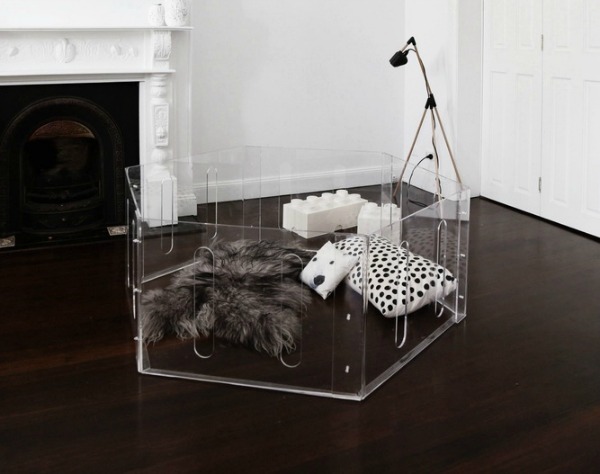 You can buy the Invisible Play Pen for $535 from Mint Rhapsody or online contemporary design studio, Obtain.